Get set for an activity-filled start to the new year with WOW JBR’s series of events in January. Whether you’re a child or an adult, JBR offers a packed programme with fun, games and live entertainment for everyone. An activity zone will keep your weekends busy with live DJ music, food stalls as well as giant games and foosball tables to fuel your sporting spirit. Between 21 and 23 January, jazz lovers will be treated to melodious tunes with performances by Spinal Jazz, Yanna and Vitali, and James and Hana. Sing along to classic anthems songs as Dubai’s hot new power trio, Big Mouth, puts on an energetic show on 25 January. Enjoy indie folk music with elements of reggae, ska and gypsy rhythms played by Jaye and Foe on 26 January, and feel yourself swaying to latest hits by Italian artist Nya Crea as she takes to the stage. In honour of the Dubai Police Academy candidates’ graduation ceremony, a number of events will be held throughout the emirate from 4-7 January. Whether you’re by the beach, in Downtown Dubai or even in Hatta, don’t miss the exciting displays which will be taking place. At City Walk on 4 Jan, there will be a luxury car show, musical band show, and police parade. At Global Village on 4 Jan, there will be a musical band show and luxury car show. On the boulevard in Downtown Dubai on 5 Jan, there will be a musical band dhow, horse riding show, luxury car show and police parade. In JBR on 5 Jan, there will be a motorbike show, horse riding show, luxury car show and musical band show/police parade. On Kite Beach on 5 Jan, there will be a luxury car show, horse riding show, and motorbike show. In Hatta on 6 Jan, there will be a luxury car show, police parade and musical band show. In Festival City on 7 Jan, there will be a luxury car show, police parade and musical band show. Russian pop star Valeriy Meladze will be stopping off in Dubai as part of his anniversary tour, and will be performing two gala concerts at the Burj Al Arab’s Al Falak Ballroom on 4-5 January. Both evenings will start off with music from Evgeniy Morozov’s Quartet, with the option of enjoying a sumptuous dinner in the ballroom. After that, Meladze will take to the stage for a spellbinding performance, singing a mix of his biggest hits, including ‘Samba Belogo Motilka’ and ‘Se La Vi’, as well as some new material. This January, the Alchemy Project will be bringing the latest Cirque Du Soleil stage show to Dubai for its Middle East debut, with twelve days of shows. The production, called TORUK – The First Flight, was inspired by James Cameron’s 2009 blockbuster film Avatar. 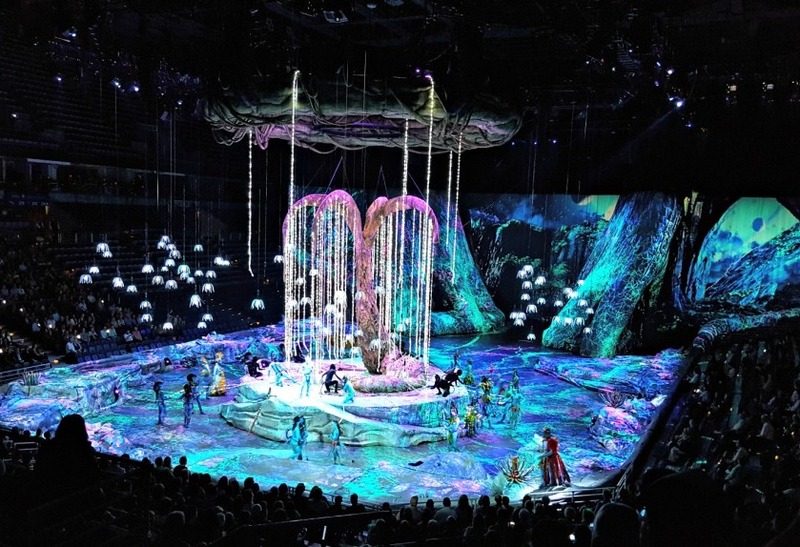 The show promises to transport you to the far-off world of Pandora in a visually stunning show, with the planet’s creatures brought to life with huge puppets. Expect an unforgettable story mixed with breath-taking acrobatics and stunts, as well as original music. Join in the celebrations at this festive concert, with a live performance from Stas Mihaylov, one of the most in-demand Russian musicians. The singer-songwriter is best known for hits including ‘Dlya Tebya’ and ‘Vu Vot I Vsyo’. He’s released 11 studio albums and won 9 Golden Gramophone Awards, the prestigious Russian music awards. On the night, Mihaylove will take to the stage to perform an assortment of older hits and new songs. The night will also include a gala dinner, a mini fashion show, presentations of new jewellery collections, and an exciting raffle draw. NYC-based Carmen Lynch has charmed audiences locally and abroad with stand-up comedy in both English and Spanish. Her funny routines helped her get featured on popular night shows such as ‘The Late Show with Stephen Colbert’, ‘Conan’, ‘The Late Late Show with Craig Ferguson’ and ‘The Late Show with David Letterman’. Winner of the Scottish Comedian of the Year Award in 2006, Mark Nelson is a highly sought-after comedian and writer, and considered one the UK’s biggest-hitting comedy powerhouses. His dark humour and witty one-liners will have you laughing at unexpected moments. With sold-out hour-long shows at nine Glasgow International Comedy Festivals, he is sure to put up an unmissable performance. Another hilarious award-winning stand-up comedian, Luke Toulson is a regular at the biggest comedy clubs in the UK. With his laid-back yet incredibly funny delivery, he has scored an appearance on shows such as ‘Russell Howard’s Good News’. His Edinburgh Fringe show, ‘I Don’t Know How I Feel About My Kids’ was also selected by Amused Moose as one of the Top 10 Comedy Shows at the Fringe. Looking for a unique shopping experience this winter? This January, Market Outside The Box returns for its fifth edition as part of Dubai Shopping Festival. Spread across 11,300sqm of lawn in Burj Park, right in the heart of Downtown Dubai, the al fresco market features a mix of independent local labels and global brands. Visitors can spend hours browsing through the stalls of more than eighty vendors, which sell everything from elegant clothes to colourful mementos. There’s also a packed programme of entertainment on offer, with live music, drama, dance and poetry performances. Those looking for a more relaxing day out can catch the latest creative documentaries in the pop-up cinema, take a break in the chill-out zone, or just sit back and soak up the unobstructed views of the iconic Burj Khalifa and The Dubai Fountain. If you work up an appetite, you can choose from a wide selection of food trucks and stalls, where you can grab a quick and tasty bite. The market is open from 11-20 January, and it’s completely free of charge, so there’s no reason not to head down. Head to Dubai World Trade Centre on 12-13 January to experience The Extreme Sports Expo, which will be running alongside four other events – the Dubai International Bicycle Exhibition, the Dubai Motorbike Festival, One Breath Dive Expo, and the Photography Expo Dubai. The two-day event will gather together brands, communities and athletes from all aspects of extreme sports. It’s set to attract thousands of visitors from across the Middle East, and will be packed with competitions, exhibitions, and shows. The Extreme Sports Expo will have dedicated pavilions for Aerosports, Watersports, and Land Action Sports. Visitors will also be able to watch the Motorbike and ATV stunt battles, with competitors from around the world taking part, as well as the International Underwater Target Shooting Championships. From 18-20 January, audiences will see the world’s most famous detective, Sherlock Holmes, come to life on stage at The Junction. The play, brought to Dubai by The Hive and Tall Tales Production, will see Sherlock taking on his most difficult case yet, joined by a host of Arthur Conan Doyle’s popular characters, including Dr. John Watson and Mrs Hudson. Directed by Jimish Thakkar, the play’s multicultural cast includes actors from eight different countries. Fans of both theatre and Sherlock Holmes won’t want to miss out on this. Following performances of The Nutcracker and Dreams Come True, the students of The Ballet Centre, the city’s first dancing school, will be taking on Lewis Carroll’s classic story of Alice’s adventures in Wonderland. The show will incorporate all kinds of dances, from classical ballet to modern and tap dance, so there’s something for everyone to enjoy. There will be two shows on the day, at 3pm and 6pm, and children younger than three years old won’t be permitted. Touted as ‘the theatrical event of the year’, the smash hit musical ‘Evita’ will feature at Dubai Opera. The story of Evita Peron, Argentina’s first lady, who dedicated her life to charity work and helping the nation, comes alive on stage under the direction of Bill Kenwright. Originally produced by the kings of theatre Andrew Lloyd Webber and Tim Rice, the show was so successful that it ran for over forty years on New York’s Broadway and London’s West End. The most recognised element of this show would be the Oscar-winning movie, of the same name, in which Madonna played Evita, and brought even more attention to the music. Her rendition of the famous song ‘Don’t Cry For Me Argentina’ topped the charts in eight countries and is considered a classic. Catch this song and all the other hits at Dubai Opera, at another thrilling theatrical performance. Since its first edition back in 1989, the Omega Dubai Desert Classic has seen some of the world’s greatest golfers competing here in Dubai, with winners including well-known names such as Ernie Els, Rory McIlroy, and Tiger Woods. It’s known as the Middle East Major, and has now become one of the leading international golfing events. Spectators will be able to visit Emirates Golf Club and watch the legendary golfers competing over four rounds as they battle it out to lift the trophy. Golf die-hards and sporting enthusiasts alike are sure to enjoy the suspenseful competition on the greens.